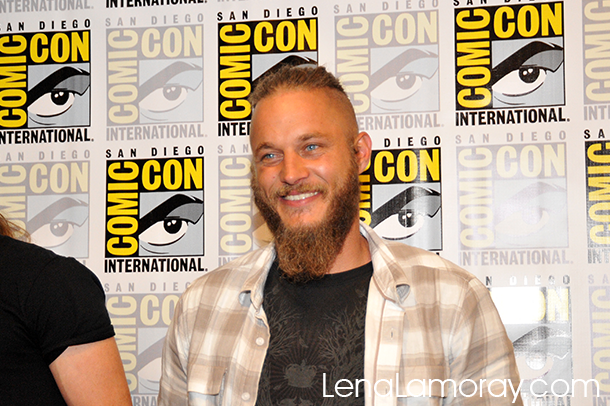 Travis Fimmel and Clive Standen took some time out of their busy schedule to discuss Vikings. In season two, Rollo and Ragnar are obviously going to battle. I’ve been a fan of Travis’ work for a very long time. His work alongside Patrick Swayze in The Beast is unforgettable and his performance as Ragnar Lothbrok is legendary. It was an honor to be able to get some insight directly from the duo. They were so much fun. Vikings is one of those rare television shows that will instantly enthrall you. I don’t know of a single person who just watched the premiere. It’s can’t-miss television at its finest. I’m so glad that the History Channel and Michael Hirst joined forces to put this masterpiece together. Do not miss the new season in 2014 on History. Clive Standen: I always try to do loads of research before I go to any job and I think that is part of the fun of being an actor, to immerse yourself completely. With this job, I think it was a little more special because I think this culture and the religion and everything about the Vikings has never really been portrayed on the screen before from the inside out. I felt like we had a big mountain to climb to get it right. I read loads of books and I am still learning now. Anytime I see something on the Vikings, or if I find any books, I’m always researching and learning because you never know where the scripts are going to take you. It’s nice to be prepared and just ready for it when it comes. Travis Fimmel: The weather. Last year it rained all year, but this year the weather has been really nice. We’ve had beautiful summers. And the schedule, we are not a big budget show. We are like half of what Games of Thrones is, so we have to work really hard to keep it real high quality. We have to give real credit to the Irish crew because they do a really great job. Clive Standen: They’ve done so much now. They’ve done four seasons of The Tudors, they did Camelot, and they’ve done Braveheart. Way back in Braveheart – that crew is the best of the best with working in outdoors and knowing how to get what they want in harsh conditions. We are really lucky to have them. No one is finding their sea legs because they’ve all been there, done that. It’s us that have to come and step up to the plate to match their professionalism. Travis Fimmel: Just humanizing people that are very brutal. It’s sad to follow bad guys, in a way. I think Michael did a really good job of making it a family saga, and that sort of stuff, where you get behind guys that don’t always do really nice stuff. Clive Standen: Hopefully, you get to the heart of why they do it, as well. I’ve got three children myself and you have to put yourself in a place where you go what would it take for me to have to do that sort of stuff. If I were providing for my children, I would have no choice. I think most good dramas are about the choices that the characters make, whether they regret those choices that they make and how that shapes the arc of the character. Clive Standen: For me, it was in episode two where we got in the boats. We had night shoots and the hydraulic boat was moving around and ice-cold waves are splashing into us and that moment for me was the first moment I realized how lucky I was to be there. That’s something I wasn’t prepared for. This is something where I can grow old and no one can take it away from me. When I’m a granddad, my kids will tell me that I’m boring and I can tell them that I wasn’t once. Travis Fimmel: Yeah, yeah, yeah…I die. No, there is a lot of stuff that happened in episode nine where you really realize how vast Scandinavia is. There is a real reason why we are going to go west for the survival of our people. Clive Standen: I think what we try to show, as well, is that every time the Vikings go on a raid they lose good men, good young men. For me, there is a moment in one of the episodes we just shot that feels very much like Vietnam. After Vietnam, there is a whole generation of men gone. You just have women, children, and old men. That’s a side that we have to show as well. They are not superheroes. Travis Fimmel: I don’t think their relationship will ever be the same after the first couple of episodes. Clive Standen: I think it has built up to a point where we have to settle our differences in a very old-fashioned way, which is beating each other – as your saw in the teaser. That’s the only way that there is any chance of reconciliation, if any, if both of us can come out of this alive. Clive Standen: Compared to some other television shows – I mean if you were doing a courtroom drama or some other kind of procedural than yes, it’s really challenging. It’s so much fun. There is no point spending any time complaining when you are cold or tired. I can’t wait to get on the set and do it all again. It’s a mental and physical workout. Travis Fimmel: And free lunches every day, per diem on Mondays. Travis Fimmel: Franklin is amazing. You work so much and you try to sneak some rehearsals in. You get really used to it. It’s pretty much half made up when you are doing it. 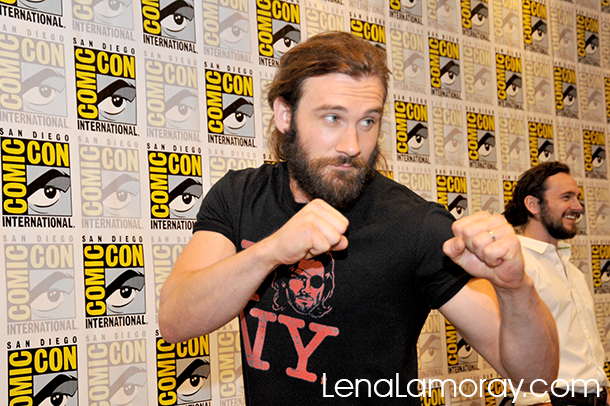 Clive Standen: It becomes quicker to get down the choreography because you just learn the way the weaponry is. It’s a big step up from season one to two already. 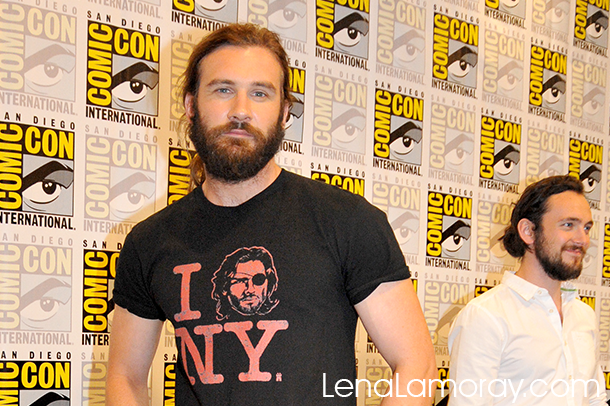 Clive Standen: What you see on screen, that’s real, people. We are acting right now. Travis Fimmel: No, everybody is great. Travis Fimmel: There you go, very nice. [An Australian thing?] Oh no, I guess it’s a farm boy thing. Clive Standen: I think it’s a thing from Britain. Whenever you see the Australians come over and spend time with them, they always have a great work ethic. That’s why they get the jobs. If a job is worth doing, it’s worth doing well. He’s the prime example of it. Clive Standen: They are more concerned with craft services and stuff like that. I just don’t get that. When you are on the top of a mountain there are no craft services. Travis Fimmel: In the first year, there was one sunny day. There was one sunny day out of six months. No, the landscape; the location you just can’t help but appreciate. It’s a beautiful, beautiful area. Travis Fimmel: Dee Corcoran is brilliant. She’s such a lovely lady, our hairstylist. We all just didn’t want to have long plain long hair. We had to have long hair. Travis Fimmel: We were sort of free to do whatever. There were no real pictures of Vikings and they didn’t document anything, so they let us do anything.